Someone is probably getting fired over this one. 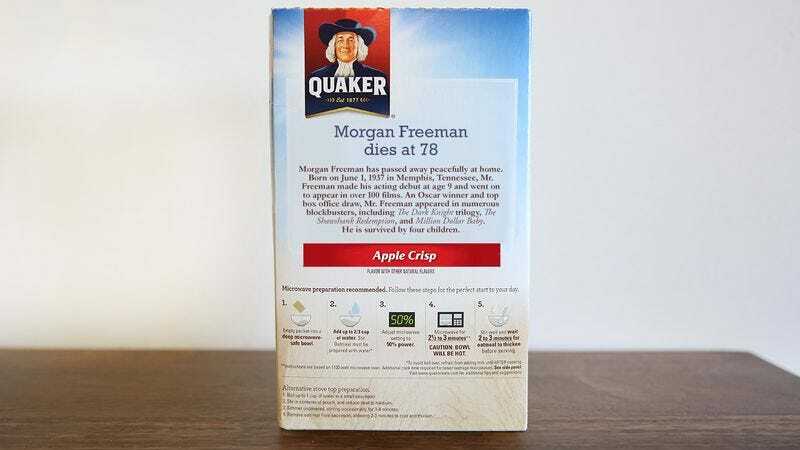 The Quaker Oats Company is apologizing for making a big-time error in an incredibly visible way: publishing the obituary of beloved actor Morgan Freeman—who is alive and well—on its oatmeal boxes. By the time Quaker officials caught the mistake, it was too late. Not only were the boxes on shelves across the nation, but pictures of the obituary were already flooding social media, where thousands of posts are mocking the incident using the hashtag #QuakerOafs. Most of the reactions to the goof have been in good fun. Freeman himself even masterfully responded to the incident by posting a photo of himself eating a bowl of oatmeal to his public Facebook fan page. But based on the seriousness of this press release concerning the incident, Quaker apparently isn’t laughing it off. The Quaker Oats Company made a major and regrettable mistake this past week when we published the obituary of noted actor Morgan Freeman. Occasionally, obituaries are written for people who are still living to use in the event of their death. Quaker had prepared one such obituary for Mr. Freeman, and it was erroneously printed on our oatmeal boxes. We apologize for any inconvenience this has caused Mr. Freeman, his family, and his many fans. Quaker is offering to exchange free boxes of oatmeal for the misprinted ones, but it isn’t going to find many takers. The boxes have already become coveted collector’s items, and a few have even started showing up on eBay for a pretty penny. It’s okay, Quaker Oats—everyone makes mistakes. Just don’t expect anyone to take you seriously when you publish your next obituary!